At this time and age, tons of hackers are revolving around in the blogosphere with only one motive to hack as many websites as they can. 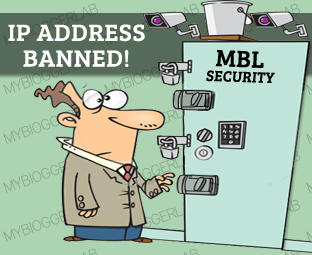 Therefore, to protect our blog from brute force attacks or hijacking it’s essential to have a strong security system. There is no doubt that Blogger Platform has the indestructible security whenever we compare it with one of the leading Blogging Platform WordPress. Since, Blogger enabled websites works on Google’s Server, so it is extremely tough to hack or hijacked them. However, sometimes content cloning, click bombing, and spam commenting becomes the biggest pain. In this situation, a person tries to find the culprit and restrict it from access his website. In other words, we can say that banning his IP Address. How The IP Address Banning Works? Whenever, a Visitor who’s IP is in the Blacklist would visit your website he will get a Message that, “Your IP address XYZ is Banned” and then, within seconds it will redirect the banned visitor to a prescribed destination URL. We have attached a screenshot below so everyone can easily understand its meaning. Go To Blogger.com >> Your Site >> Template. Replace Your-IP-Here with your IP Address so, the script could fetch your LocalHost. Without adding your personal IP Address, this script would stop working. Last but certainly not the least Replace Banned-IP-1 the IP Address that you want to ban. There is no limit for IP Banning. Therefore, we can ban unlimited IPs without any problem whatsoever. All Done: After Add your and the victims IP Address save the Template by pressing "Save Template" Button. Now your site is safe from unwanted users. Well, Since this script allows to add unlimited IP Address so we can block as many users. Its not possible to ban every single spammer but it would help users to a great extent. You have used a very simple function in which IP's are hard coded (pre-defined).This can be workable on only few spammers who do not know technical details. Proxy sites do Help But, We can also Include Their IPs Too. Since, it supports unlimited IPs banning. well, most of the spammers are smart and they can use online proxies or tools to access websites. If there were any system to block comments of a particular user, like xyz@gmail.com, then it could be really useful. Great post @syed But would you give me google search image redirect script for blogger. i want to redirect my blog images from google. i have used some scripts but when i use those scripts on my blog. they running well but my blogger editor automatic redirect. and after that i got blank page. after install this scripts i can access in my blogger editor page. I give this scrips in this link. please check it. i install this scripts this tutorial according. if you have any suggestion about this scripts and have another scripts give me. Hopefully, I Would try to Come up with something really Great, Thanks for the Boost Up Sis. Dude, Since The Commenting System is owned by Google. Therefore, we can't do modification because all the Data is controlled by Blogger Team. Lets hope we could do something with this issue. Hi am The Rux, very well your website to help those who need a little guidance. On this subject because not working, the blocked ip? the (script) this goes before or later. It works pretty fine, you can even add your IP and it will block that too. Works fine! I Think, you are not writing your IP Address correctly.Script is fab, must be only you who is facing the error. Do you know any better way? If yes then shoot it to me. The best way is banning a masking host ( their internet connection ), because at that point they wont be able to change their IP and rejoin the site. Once you ban their internet service from your site, it wont matter how many times they change their IP. It's an old trick that IRC uses. Since these comments are old, that means blogger has changed significantly. Well I hope I was able to help.